The Willamette River Steelhead Project is a long-term monitoring, research, education, and environmental enhancement project. Focus is on the condition and health of Portland, Oregon's riverine plant and animal populations and of its rivers, lakes, ponds, and streams. Particular emphasis is given to Portland's anadromous fish populations--including endangered runs of Willamette Steelhead--and to local impacts to the waters of Columbia, Willamette, and Sandy rivers as they enter and leave Multnomah County. This proposal took more than two years to develop and begin. This website contains a current description of the project, a brief history of its development, and the complete text of a long-term partnership agreement drafted by representatives of Jefferson High School, Portland, and Oregon Websites and Watersheds Project, Inc. and signed July 21, 2000. It also contains an index of current projects, events, and archived data. The goals of the the Willamette River Steelhead Project are consistent with the Mission of Oregon Websites and Watersheds Project, Inc.: 1) a commitment to education and employment opportunities for Portland High School, College, and young adult populations, 2) development of a community Internet website to archive scientific data as it develops and to inform local residents and the interested public regarding current findings and opportunities, 3) the use of local science-based environmental enhancement projects for education, employment, and wildlife uses. Chinook Release. 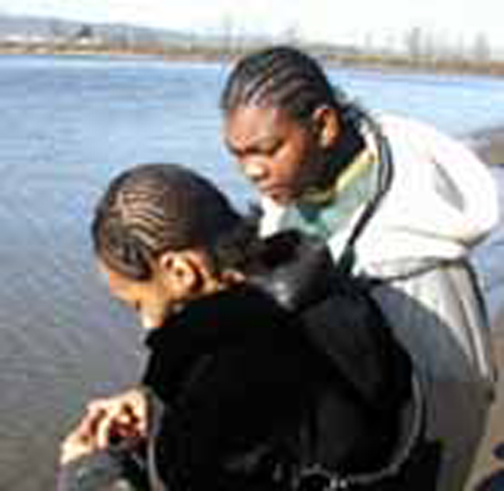 On January 26, 2001, students from Parkrose High School and the Urban League Portland Street Academy joined forces with the Help Our Salmon Program and the Portland Salmon Corps to release Chinook fingerlings into the mouth of the Columbia Slough, where it enters the Willamette River in North Portland. Chinook are considered an endangered species in the Portland area, and may compete with Steelhead and other anadromous fish for local resources. Frankenfish and Exotic Invaders. GMO (Genetically Modified Organisms) fish and fish from other areas of the world have been released into Oregon rivers, lakes, ponds, and streams, creating potential problems for Steelhead and other protected species in the Willamette River. What can students do to help resolve these possible problems? Portland Harbor Superfund. In December, 2000, the US Environmental Protection Agency (EPA) declared the Portland Harbor portion of the Willamette River a "Superfund site" because of the amount of toxins and other pollutants in the River's sediments. Willamette River pollution is viewed as a serious problem for resident and anadromous fish populations. This page created July 27, 2000. Updated March 12, 2001. ©2000, 2001 -. Oregon Websites and Watersheds Projects, Inc.